Virginia Minor tried to register vote; registrar Happersett said no. Virginia sued. She said that she was a citizen of the United States and the privileges and immunities clause of the US Constitution entitled her to vote just like male citizens could. The Supreme Court heard the case and issued its ruling in 1874. "No person except a natural-born citizen or a citizen of the United States at the time of the adoption of the Constitution shall be eligible to the office of President,"
and that Congress shall have power "to establish a uniform rule of naturalization." Thus, new citizens may be born or they may be created by naturalization. At common law, with the nomenclature of which the framers of the Constitution were familiar, it was never doubted that all children born in a country of parents who were its citizens became themselves, upon their birth, citizens also. These were natives or natural-born citizens, as distinguished from aliens or foreigners. Some authorities go further and include as citizens children born within the jurisdiction without reference to the citizenship of their parents. As to this class there have been doubts, but never as to the first. For the purposes of this case, it is not necessary to solve these doubts. It is sufficient for everything we have now to consider that all children born of citizen parents within the jurisdiction are themselves citizens. The Court stated one “sufficient” condition for a natural born citizen, but it explicitly said that it did not consider other possible conditions. This is why Minor v Happersett does not define the term natural born citizen. Later, in 1898, the Court decided the question of the children of aliens in the case of United States v. Wong Kim Ark. If the law is wrong, it ought to be changed; but the power for that is not with us. Bold faced highlighting in the text is mine. Doc and NBC aren’t lawyers and have not been schooled in law but Leo Donofrio and Mario Apuzzo have…Fail. “. . . but Leo Donofrio and Mario Apuzzo have failed. What you say is true. I’m not a lawyer. It doesn’t take a law degree to see that birther lawyers are trying to mislead the public when they claim that the Court decided something that the Court explicitly said that they weren’t going to decode. I’m afraid Mr. Apuzzo is trying to put up a facade to hide the fact that he has no chance of ever convincing a court that he’s right. John: Doc and NBC aren’t lawyers and have not been schooled in law but Leo Donofrio and Mario Apuzzo have…Fail. I am a lawyer and Doc and NBC can and have argued circles around the likes of Donofrio and Apuzzo. They pretty much get nothing right. I think New Jersey needs to make its bar exam harder. The law really isn’t that hard to understand when one isn’t invested in unseating a President by whatever means necessary. So we know that Obama can never an NBC under the definition that has no doubt. There will always be doubt if Obama is not under that category (Born on US Soil to 2 US Citizens) and no court has even claimed to solve that doubt. Apuzzo has been trained so well in the law that he’s lost every single case he’s attempted on the birther issue, and Donofrio, after losing his cases, now simply blogs about these “astounding” and “amazing” and “100% fact” legal cases that he, himself, isn’t willing to put his law license on the line for by being the one standing in a court of law. It’s easy to say your argument is right when you volunteer to risk going to court to advocate for it, and suppress any comments to the contrary in your echo chamber. Of course, when Georgia, like Indiana before it – with lawyers and judges that have far more training in law than Apuzzo and Donofrio – slaps down his Minor argument, he can stand above the fray and continue to say they were just oh so wrong, and that OTHER PEOPLE can continue to risk sanctions by pushing his legal bupkis. As soon as Donofrio, under the threat of sanctions, is willing to tell the court to its face that it is wrong, instead of armchair quarterbacking from his blog, I’ll be happy to lend his words greater credence. Until then I’ll go with the judges and real lawyers that believe he’s wrong. Well Ballantine you can submit your crendentials to Leo on his blog and start a legal war with him. That is, when you won’t volunteer t go to court. Thanks for a very succinct article, Doc! 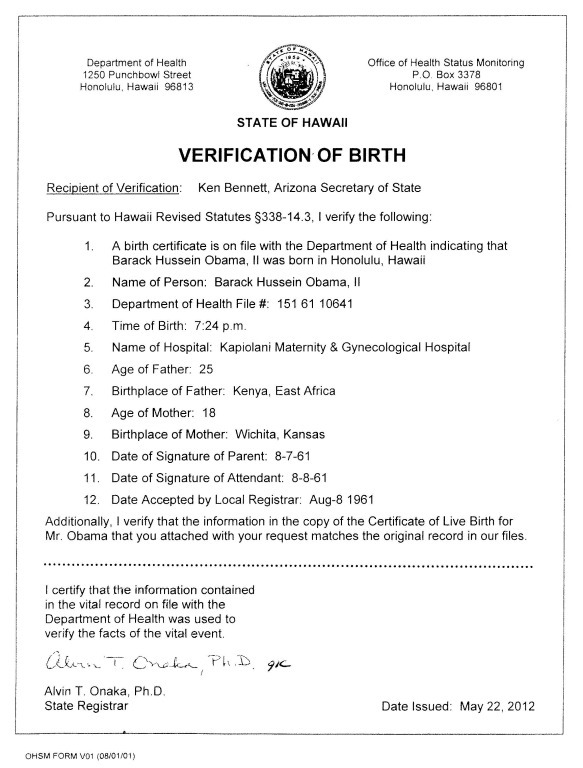 You manage to quickly and clearly show what the birther prophets fudge, any why they are wrong. Amazing that discussion of this case keeps going ’round and ’round. John won’t be the first to stamp his foot and gnash his teeth. Well, the court didn’t hold she was a citizen. Such discussion was obiter dicta. The holding of the case was that the Constitution did not give anyone the right to vote including a citizen. Since citizenship was deemed irrelevant to the right to vote, it was obviously unnecessary to determine it to dispose of the case. For example, the Missouri supreme court below didn’t mention Minor’s citizenship status as such court also ruled that, citizen or not, she would not be entitled to vote. The defendant never contested or argued her citizenship status at any level. The defendant did not even argue the case before the US Supreme Court and hence it appears that the citizenship issue was never briefed or argued. Such is why dicta is not precedent as it is clear the issue didn’t recieve the full consideration that the actual question before the court gets. The truth, of course, is that Vattel’s writings, were they applicable in this case (which is highly debatable), still do not lead to the conclusion that Obama is not an NBC — quite the contrary. what about the 1844 New York state case, Lynch v. Clarke? And the constitution itself contains a direct recognition of the subsisting common law principle, in the section which defines the qualification of the President. “No person except a natural born citizen, or a citizen of the United States at the time of the adoption of this constitution, shall be eligible to the office of President,” &c. The only standard which then existed, of a natural born citizen, was the rule of the common law, and no different standard has been adopted since. Suppose a person should be elected President who was native born, but of alien parents, could there be any reasonable doubt that he was eligible under the constitution? I think not. 6. Upon principle, therefore, I can entertain no doubt, but that by the law of the United States, every person born within the dominions and allegiance of the United States, whatever were the situation of his parents, is a natural born citizen. Wouldn’t basic grammar rules include children born of one citizen parents, similar to “people owning tickets to the NBA finals” including people who own just one ticket to one final game? I would expect courts to use the more precise “all children born in a country of parents who *both* were its citizens” if they meant that because the other variant leaves ambiguity. OTOH they wouldn’t have said “of parents, at least one of whom was a citizen” because it would be redundant, given that “children of parents who…” already encompasses that. John makes a critical error in logic. His argument boils down to, hey, my guys are lawyers, and you arne’t, so my guys must be right. This ignores the fact that on this issue and a myriad of others, there are highly competent lawyers who passionately disagree with one another. By John’s logic, one could say to him (I assume he is not a lawyer) that he must be wrong, because I’ve got these lawyers who agree with me. It’s a paradoix, but highly intelligent, competent lawyers (not saying that’s the case with John’s heroes) sometimes come down on the wrong side of a legal issue, so even dull-witted laypeople who disagree with them are right. Nice job, Doc. I agree. Chief Justice Waite opines on one condition to meet the status of Natural born citizenship, but not at the exclusion of others. Nevertheless, it’s orbiter dictum and great for discussion. donna: what about the 1844 New York state case, Lynch v. Clarke? The foundation for many subsequent birthright citizenship rulings, even US v WKA. See this paper for more cases. The Magic M: Wouldn’t basic grammar rules include children born of one citizen parents, similar to “people owning tickets to the NBA finals” including people who own just one ticket to one final game? The problem with Chief Justice Waite’s gratuitous comment about “natural born citizenship” is that it had absolutely nothing to do with the decision of the court in finding that the Privilege Clause of the 14th Amendment didn’t confer the right to vote to women even if women were citizens. That is why his “natural born citizenship” comments were dicta. 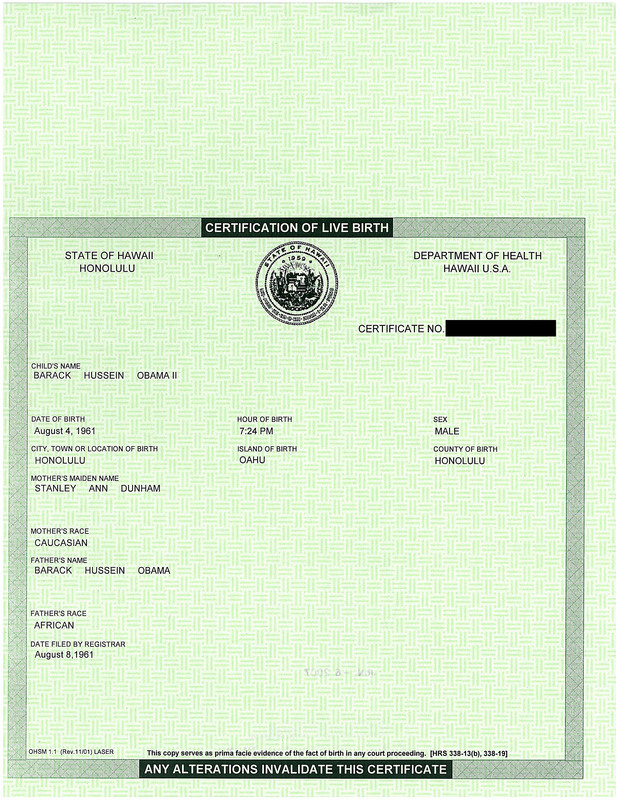 Furthermore his comment about “doubts” of native born or natural born citizenship status of children born to other than citizen parents, he himself remarked “For the purposes of this case it is not necessary to solve these doubts [citizens children born without reference to citizenship of their parents].” Id at 168. As such, Chief Justice Waite’s gratuitous comments about natural born citizen weren’t germane to his decision and in fact no subsequent courts have relied on his “comments” as law of the land in defining natural born citizen. It is noted that Justice Gray mentioned that Minor being “born of citizen parents within the United States was a CITIZEN” not a NATURAL BORN CITZEN. Which is why their failures are so much more interesting. Note that Apuzzo was slapped down by the Court and Leo was ordered to pay cost in his ill-fated Chrysler law suit. DOC and NBC have been far more successful in predicting the outcome and finding the relevant prior art. On Turley’s blog, there was much discussion of the Stearns and Abramowicz law review on holding and dicta. It essentially defines holding as a legal proposition that is necessary or suffient to the disposition of the case or another holding of the case. A proposition is necessary to another if the second cannot be true if the first is false. A proposition is sufficient to another if the second cannot be false if the first is true. Here are 5 legal propositions following by the disposition in (6). (6) Nothing in the Constitution grants anyone the right to vote. (3), (4) and (5) are necessary propositions for if any one is false, the (6) is false. (1) and (2) are not necessary propositions. The Court can make statements (3) – (6) even if (1) and (2) are false. (1) and (2) are not sufficient propositions. (1) and (2) being true does not mean that any of (3) – (6) must be true. Hence, (3) – (6) are holding and (1) and (2) are dicta. If the Court had ruled that citizenship did grant Minor the right to vote, then (1) would have been a necessary proposition and holding since the Court could not have made such a ruling had Minor not been a citizen. In no event would (2) be holding as the case had nothing to do with children of aliens. Atticus Finch: It is noted that Justice Gray mentioned that Minor being “born of citizen parents within the United States was a CITIZEN” not a NATURAL BORN CITZEN. So then you contend they would be “naturalized citizens”? nbc: Which is why their failures are so much more interesting. Note that Apuzzo was slapped down by the Court and Leo was ordered to pay cost in his ill-fated Chrysler law suit.DOC and NBC have been far more successful in predicting the outcome and finding the relevant prior art. Here is the question. Is there a single citizenship case that either one of them actually get right? Not sure there is. To me, the most important part of the paragraph dealing with citizenship is also the part that neither side ever seems to mention. To me, this seems to make clear what the Court is saying. At birth, you can be a natural-born citizen, or you can be an alien. It would not be possible, legally, logically or otherwise, to say that someone could be born a citizen, even a dual citizen, and also be an alien. 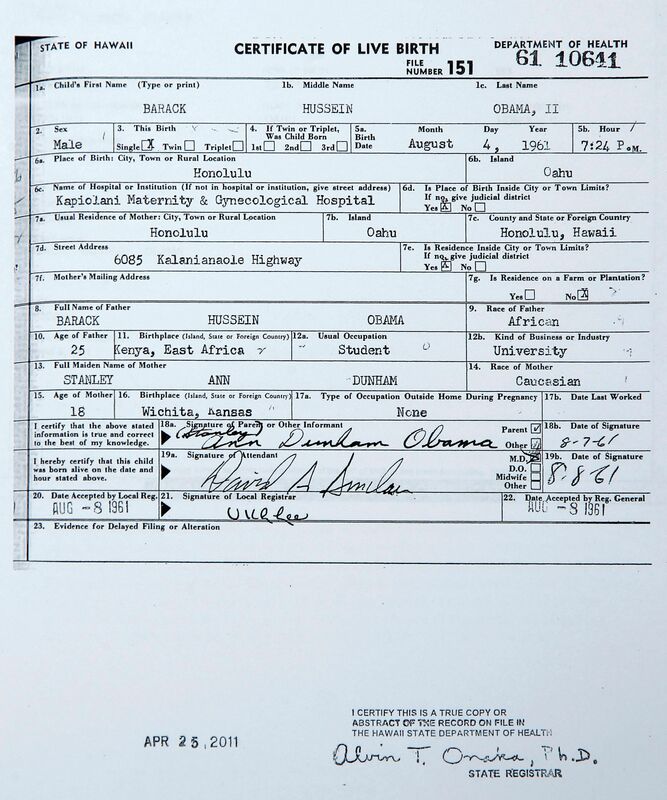 Thus, the Minor decision, which birthers point to as the Holy Grail, tells us that President Obama is an NBC. ASK Esq: To me, the most important part of the paragraph dealing with citizenship is also the part that neither side ever seems to mention.“…as distinguished from aliens or foreigners.”To me, this seems to make clear what the Court is saying. At birth, you can be a natural-born citizen, or you can be an alien. It would not be possible, legally, logically or otherwise, to say that someone could be born a citizen, even a dual citizen, and also be an alien. 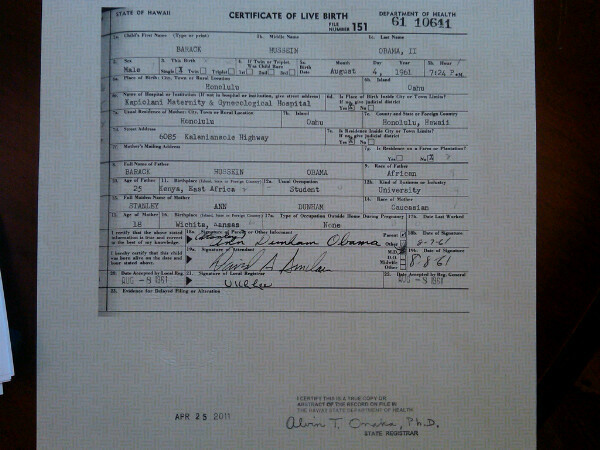 Thus, the Minor decision, which birthers point to as the Holy Grail, tells us that President Obama is an NBC. And where does such dichotomy come from? Could they be talking about the common law? Oh, Waite actually says he is talking about the common law. That either means someone thought Blackstone, Coke and every other writer on the common law was wrong or such the discussion is orbiter dicta that was not researched, briefed or argued so someone on the Court was not sure about the common law rule. The problem with Chief Justice Waite’s gratuitous comment about “natural born citizenship” is that it had absolutely nothing to do with the decision of the court in finding that the Privilege Clause of the 14th Amendment didn’t confer the right to vote to women even if women were citizens.That is why his “natural born citizenship” comments were dicta. Virginia’s husband was the author of the original complaint. Mr. Minor brought up many personal, political and legal issues in his complaint. Chief Justice Waite edited the question before the Court to one paragraph legal issues that would be addressed. Mr. Minor correctly asserted the registrar of voters, Happersett, would register adult males residing in the State of Missouri if Happersett concluded they intended to naturalize as a U.S. Citizen in the future. It was Mr. Minor who complained Natural born citizens; such as Virginia Minor, were being denied registration privileges to vote when some foreigners were allowed to register and vote in the State of Missouri. Chief Justice Waite offered the dicta in the opinion concerning a Natural born citizen to acknowledge Mr. Minor’s complaint some Natural born citizens were not allowed to register to vote. just a reminder: o-b-i-t-e-r dictum. Just recently, Leo posted a new article where he attempts to explain away the pesky other way section of his favorite paragraph. In short (sorry on mobile so hard to source), his argument is that the rest of the paragraph uses citizen, not natural born citizen, thus those with alien parents are only citizens, not NBC. Ballantine: Here is the question. Is there a single citizenship case that either one of them actually get right? Not sure there is. Leo is now citing the work by George Collins and argues, based on a side comment in US v Wong Kim Ark, that the Court did not find WKA to be natural born, even though it spent many pages outlining how to determine the citizenship status of WKA, starting with the observation that the Constitution uses the term Natural Born and continues to outline its meaning. Leo thus ignores both the government brief which raises the natural born status as the logical outcome of the lower court’s ruling as well as the dissenting judge who laments that WKA could now run for the office of the President. Leo has a fascinating ability to focus on minor details while ignoring the big picture. I am not sure how this benefits his chess or poker ‘careers’. But it is devastating for legal arguments. Northland10: Just recently, Leo posted a new article where he attempts to explain away the pesky other way section of his favorite paragraph. In short (sorry on mobile so hard to source), his argument is that the rest of the paragraph uses citizen, not natural born citizen, thus those with alien parents are only citizens, not NBC. Ignoring that the Court observes that citizens include natural born and naturalized citizens and that WKA cannot be the latter. Common logic and reason does not appear to be a necessity any longer? 1570s, Latin, lit. 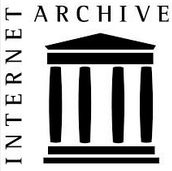 “by the way,” from ob “to, toward” (see ob-) + iter “journey” (see ion); hence obiter dictum (1812) “statement in passing,” a judge’s expression of opinion not regarded as binding or decisive. Attempts to use Minor v Happersett as [“binding”] precedent have been presented in legal briefs at the Supreme Court of the United States in Kerchner v Obama (Mario Apuzzo) and in Hollister v Soetoro (John Hemenway, Atty).. Both petitions for Writs of Certiorari were denied. The Roberts Court has no interest in Minor v Happersett being applied to presidential eligiblity when it was a women’s suffrage suit ONLY. Not even one of the nine Justices asked the Respondant (Obama) to submit a defense brief. Daniel: So then you contend they would be “naturalized citizens”? These state laws that have been attempted recently to define personage in the womb adds an interesting wrinkle. If a person becomes a citizen at the moment of birth (14th) if born in and under the jurisdiction of the U.S., what is their state before birth re: citizenship? Are they citizens? Are they stateless? If the act of exiting the womb grants them citizenship, isn’t this naturalization in the broadest sense of the word, i.e. a transition of a person’s citizenship status from non-citizen to citizen? Wouldn’t this imply that the states that are attempting these laws are precluding any future NBC children since their children would all be naturalized and there are only 2 types of citizen: NBC and naturalized? Sounds like they are cutting off their nose to spite their face. Perhaps Ballantine and Hermano fell victim to well-intentioned, english-oriented spellcheckers? Or perhaps autocorrect. Many mobile devices are terrible about that! nbc: Leo is now citing the work by George Collins and argues, based on a side comment in US v Wong Kim Ark, that the Court did not find WKA to be natural born, even though it spent many pages outlining how to determine the citizenship status of WKA, starting with the observation that the Constitution uses the term Natural Born and continues to outline its meaning.Leo thus ignores both the government brief which raises the natural born status as the logical outcome of the lower court’s ruling as well as the dissenting judge who laments that WKA could now run for the office of the President.Leo has a fascinating ability to focus on minor details while ignoring the big picture. I am not sure how this benefits his chess or poker careers’. But it is devastating for legal arguments. Just a lack of understanding of how the law works. Juctice Gray didn’t have to call WKA a natural born citizen in order to clearly define the term and make clear the WKA would be one. Justice Waite didn’t call Virginia Minor a natural born citizen, but the court made clear that a person of her status would be one. Justice Gray simply called WKA a “citizen.” Didn’t say a citizen under the 14th Amendment. However, the decision made clear that he was a citizen under the original Constitution and under th 14th Amendment since (1) he would have been a natural born subject, (2) the NBC clause incorporated the definition of natural born subject into the original Constitution and (3) the 14th Amendment re-stated the same rule to clarify that it was color blind. Thus, there is no way to read the case and not understand that WKA would be thus be understood to be natural born. Apparently the ignorant think that it a court spent a zillion pages defining a term beyond all doubt, it doesn’t matter unless the court calls a person by such term. Really amatuer hour. Majority Will: “. . . but Leo Donofrio and Mario Apuzzo have failed.Fixed it. aarrgghh: just a reminder: o-b-i-t-e-r dictum. not “orbiter”. What if the opinion was written by the Hon. Justice Mariner 9? So you are admitting that your “precedent” in Minor is under doubt? Good start. The doubt, however, was resolved by the Supreme Court later. There is no longer any doubt. John: So we know that Obama can never an NBC under the definition that has no doubt. In Minor v. Happersett (1874), the Supreme Court defined two classes of persons. One class consisted of U.S.-born children of U.S.-citizen parents. The second class consisted of all other U.S.-born children. The Court used the term “natural born citizen” only in reference to members of the first class. Regarding members of the second class, the Court doubted whether they were even citizens, let alone natural born citizens. The Court distinguished “natural born citizens” from “aliens or foreigners”, suggesting that a “natural born citizen” is one who is not a “foreigner” (foreign citizen) at birth. He inserts an opinion (basically saying a natural born citizen cannot also have foreign citizenship at birth) as an explanation without presenting any evidence or argument that it is true. Birther lawyers asserting the two-citizen parent client are rather like magicians who fool their audience by misdirection. So we know that Obama can never an NBC under the definition that has no doubt. What we know, John, is that Minor v Happersett does not apply to Obama in any way. It is a false trail. The case made no comment what-so-ever on Obama’s situation. There will always be doubt if Obama is not under that category (Born on US Soil to 2 US Citizens) and no court has even claimed to solve that doubt. You are wrong, John. SCOTUS, in Wong Kim Ark, solved that doubt completely: any person born on US soil, who is not the child of a foreign diplomat or a member of an invading army, is a Natural Born Citizen. End of story. .
An attorney going before a federal appellate court claiming Minor rather than WKA is controlling precedent would be ripped a new one by the court. I have seen the reaction of courts by persons misstating precedents. Now, one could perhaps argue that WKA’s discussion is also dicta, which I think is wrong, but saying that Minor in any way says children of aliens are not natural born or that any such statement is holding would be violating their duty of candor to the court for such case says no such thing. Tonchen is simply making stuff up. The court never says that their is a second type of citizenship at birth or that reference to “foreigner” means “foreign citizen.” Hard to believe that these idiots still think calling someone a “citizen” means they can’t be a “natural born citizen” when the Court repeatedly says that native born children of citizens are “citizens” as well as “natural born citizens.” Such dishonestly would not be tolerated in a court. Nope, this is pure dicta and not necessary to reach the ruling which was about voting rights. So it is not ratio decidendi, it is not judicial dictum, but rather obiter dictum. Anyone foolish enough to cite Minor v Happersett would be facing an incredulous court. Sef: These state laws that have been attempted recently to define personage in the womb adds an interesting wrinkle. If a person becomes a citizen at the moment of birth (14th) if born in and under the jurisdiction of the U.S., what is their state before birth re: citizenship? Are they citizens? Are they stateless?If the act of exiting the womb grants them citizenship, isn’t this naturalization in the broadest sense of the word, i.e. a transition of a person’s citizenship status from non-citizen to citizen? Wouldn’t this imply that the states that are attempting these laws are precluding any future NBC children since their children would all be naturalized and there are only 2 types of citizen: NBC and naturalized? Sounds like they are cutting off their nose to spite their face. Interesting analysis, but I think you are stumbling on the word ‘natural’. Before birth, the fetus would just be a ‘citizen’. But after birth, assuming that the gestation was in a woman’s womb not a test tube or some animal womb used as a surrogate, they would be classified as ‘natural born’. Isn’t it obvious that that is what the Founding Fathers and Mothers had in mind? Sef: These state laws that have been attempted recently to define personage in the womb adds an interesting wrinkle. If a person becomes a citizen at the moment of birth (14th) if born in and under the jurisdiction of the U.S., what is their state before birth re: citizenship? Heck, even young Squeeky has been able to demolish both Leo & Apuzzo on a regular basis. All she needed to do was put in a basic and serious scholarly effort into looking at the issue and it was apparent how bogus and hollow their claims were. So yes, when hack lawyers are trying to pull disingenous pseudo-law arguments, any competent layman who looks into the issue can discover that their claims are utterly without merit. Ballantine: I am a lawyer and Doc and NBC can and have argued circles around the likes of Donofrio and Apuzzo.They pretty much get nothing right.I think New Jersey needs to make its bar exam harder.The law really isn’t that hard to understand when one isn’t invested in unseating a President by whatever means necessary. Yep. That pretty much sums it up. That is intentionally what they are trying to do. Only works on marks that are willfully susceptible, gullible and ignorant. Dr. Conspiracy: Birther lawyers asserting the two-citizen parent client are rather like magicians who fool their audience by misdirection. Why would they be citizens prior to birth? The 14th doesn’t grant them that. The 14th assumes personage begins at birth. The Constitution is silent on status prior to birth. Sef: Why would they be citizens prior to birth? The 14th doesn’t grant them that. The 14th assumes personage begins at birth. The Constitution is silent on status prior to birth. Quite true. But you were analyzing the effects of declaring person-hood at conception, were you not? These statutes are simply attempts to take away women’s right to choose, nothing more, nothing less. The lawmakers proposing these stautes don’t actually consider the logical conclusions of their proposals. I wonder if any state passing such a law will allow their citizens to vote at 17 years, 3 months post partum, drink at 20 years 3 months post partum, and charge any woman who suffers a miscarraige with involuntary, reckless or negligent manslaughter. If they really mean what they say they mean, wouldn’t they have to do that? ASK Esq: These statutes are simply attempts to take away women’s right to choose, nothing more, nothing less. The lawmakers proposing these stautes don’t actually consider the logical conclusions of their proposals. Chief Justice of the United States Supreme Court John Roberts Jr. is also a lawyer. Roberts is a well-known conservative, niminated to the bench by President Bush. The fact that Obama is the son of a man from another country who never became a US citizen was widely reported and discussed. Books, magazines, news, all over. Roberts certainly knew it. And yet, he gave Obama the oath of office not once, but twice. I’m going with Chief Justice of the Supreme Court. Because if I go with your “two guys from the internet” option, I have to plunge headlong into the shallow pool of hidden conspiracies and wide-spread coverups for which there is absolutely no evidence. Three debaters will argue for the side that anyone born a US citizen is eligible to be president (if they also meet the residency requirement) and specifically that President Obama is a natural born citizen.